Founded in 1878, J.S McCarthy Limited is Ireland’s longest established industrial painting contractor – an historic company that combines tradition and innovation in equal measure. With branches in Dublin and Cork, J.S McCarthy Limited is involved in a diverse range of complex projects that require industrial coating and lining applications right through to fireproofing and consultancy. Directly employing over 80 experienced industrial painters, and working in every major industrial environment including petrochemical, power generation, as well as on numerous bridges and stadiums, high profile projects include the Guinness Store House refurbishment and Brian Boru Bridge in Cork. Despite already adhering to world-class international standards applicable to the industrial painting industry there was still a desire on the part of the management team to achieve ISO9001 accreditation. 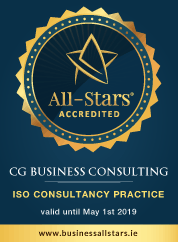 No more so than when a new business opportunity deemed ISO 9001 accreditation a critical component of their new commercial relationship. When Caroline and her team came on-board one of their greatest tasks was to communicate the benefits of ISO9001 to a highly individual and experienced workforce and management team. And now, having always applied world-class standards to their operations, J.S McCarthy have a world-class quality management system to match.